August 1, 2018. August again; I could feel the butterflies in my stomach. August signalled the return of school. No matter that the first day of school was over a month away. No matter that I actually enjoy teaching and learning with students. No matter that I relish the excitement of first-day-of-school jitters. It was now August and all the tasks I had planned to complete in preparation for school and the never-ending quest to hone my teacher craft remained unfinished, unstarted even. After having spent the past two years teaching high school history courses, my schedule for next year included two sections of Creative Writing. I was elated, but nervous. Would I be up for the challenge? I hadn’t been writing as much as I wanted. I hadn’t been keeping up with new trends in teaching writing, and I was worried about providing timely feedback to students. I was worried about being able to help my students catch the proverbial “joy of writing” bug. Lucky for me, August 3 arrived. I had registered to attend the first National Writing Project Midwest Conference (NWPMC) at UW-Madison, hosted by my own professional family, the Greater Madison Writing Project (GMWP). I had even enrolled in the pre-conference digital literacy workshop facilitated by Keynote Speaker Troy Hicks, whose practical and inspiring book, The Digital Writing Workshop had been at the core of my Teacher Workshop research during my 2012 initiation to GMWP and its Summer Institute for Teachers. Keynote Speaker Troy Hicks with participants at the “With Literacy and Learning for All” workshop. The GMWP Summer Institute remains the most transformative experience for me as both an educator and writer. During that summer, I was welcomed into a family of talented educators, dedicated to mastering their craft and committed to helping students grow as thinkers, writers, and citizens. The NWP Midwest Conference now invited me to another such opportunity. From the moment Troy Hicks shared with us his NWPMC workshop website, entitled “With Literacy and Learning for All” (do check it out for a plethora of ideas for digital writing! ), the butterflies in my stomach began to dance. Here was my invitation back into the world of writing. Here was a way to reign in my nerves and productively funnel their energy into engaging teaching strategies and lessons. So much to do; so much to learn! While the conference focused on four strands of NWP work, I focused my attention on sessions pertaining to classroom practices emphasizing the teaching of writing and digital literacy. Even by reducing my scope, I couldn’t attend all of the sessions I wanted to. Yet, once I finally selected my sessions, I had no regrets. Every workshop in which I participated prompted me to madly scribble suggestions, teaching strategies, technologies, websites, and quotes in my notebook; new ideas and questions flooded my brain: Would I be able to do this? How could I do this? Eventually the internal cacophony resolved itself in waves of I’ve got to do this. Or even I do do this…and it works. As one colleague said during a presentation on conferencing, “Today has been like drinking from a fire hose of good ideas.” Amen! And so, through the conference, I drank from this fire hose of good ideas, and not only began a journey of discovery, but also reinforced my values as a teacher, and especially a teacher of writing. As I continue to sift through my notes from the conference (which, by the way, have sent me down wondrous rabbit holes of new websites, podcasts, books, articles and digital technologies to explore), I can see five big takeaways from the experience. The workshop session “Rise Up & Write: Use your voice. Change the world” led by Bryn Orum, and other GMWP educators, including Skylar, highlighted the importance of student voice. The teachers shared their experiences teaching a youth writing camp called Rise Up & Write at UW-Madison. The camp focuses on creating community through issues, activism, and writing, During the one or two week camp, students do in-depth research on a topic of their choice, conduct root cause analyses of issues, and explore the intersectionality of issues. The camp culminates in students writing 3 pieces directed at 3 different audiences: peers, the community, and a changemaker. Many of the Rise Up & Write student writers/activists were present at the session and shared their thoughts and writing with us. They had explored diverse topics, such as environmental issues and problems related to housing discrimination. Hearing their passion and positive commitment to solving real world problems, and seeing their clear thinking and powerful writer voices left us assured that our future was in capable hands. They inspired us to bring such endeavors into our own classrooms. The Rise Up & Write Camp has such high engagement and positive outcomes because of its focus on authentic experiences and writing for real audiences. This cornerstone concept of NWP reverberated throughout the conference. I was reminded again and again that if we want to increase student engagement, we need to provide students opportunities to write for audiences beyond our classroom walls. Digital technologies can amplify opportunities for authentic writing experiences and connections to real world audiences. As J.K. Rowling wrote, “No story lives unless someone…listen[s].” At the conference I encountered or was re-introduced to many of the following media platforms which help writers find someone to listen. I’m eager to use them! Ahh, technology. For old timers like me, it can scare, overwhelm, and intimidate. But it can also facilitate and liberate. Instead of thinking of technology as a black hole from which there is no escape, I need to embrace it and allow the students to teach me how to navigate my voyage. Both Troy Hicks and his colleague Andy Schoenborn from the Chippewa River Writing Project in Michigan emphasized that even if I’m not 100% comfortable with technology, I can allow students free reign to use it for different writing purposes. As Troy Hicks showed us, effective technology for classroom writing collaboration and sharing can be as simple as using google docs or the https://padlet.com/ program. Or it can involve using powerful web-based mentor texts. Andy’s presentation “Lessons from the NY Times “Snowfall” multimedia project” led us through his use of the NY Times “Snowfall: The Avalanche at Tunnel Creek” for students to explore outstanding descriptive and nonfiction writing, as well as the narrative layers enhanced by the project’s multimedia dimensions. His student project allows high school writers to develop a story through inquiry and then create their own multimedia piece, bringing together powerful writing, computer coding (see https://www.w3schools.com/html/ for coding tutorials), and technology tools such as Google Earth, http://Screencast-o-matic.com, https://www.audacityteam.org/, and https://giphy.com/. “But how did you figure out all this technology?” I asked Andy. So, I’ve started googling things like “how to edit a gif without photoshop” and “best free recording software.” It’s all out there, and as always, the students will know way more than me. I need to trust them to find their way once I get them set up for the inquiry. Where are you at with your writing? How are you saying what you want to say? The key is to listen to what the student says about their purpose for writing, and about what they need. As Jen Doucette said, “The person who is doing the talking is doing the learning.” Mark added, “Teachers don’t need to own a piece of writing.” We need to help students feel that sense of ownership and independence as a writer. Conferences allow feedback to become a conversation in which the student is the one in control. After all, as Jennifer Breezee pointed out, “if students aren’t receptive to receiving feedback, they won’t change.” If they don’t want to change, it’s okay; our feedback is not prescriptive, but it should spur reflection and help them develop skills to solve problems for themselves. In this regard, I learned from the presenters that we need to teach students how to effectively receive feedback: assess its value, assess the consequences of using it or ignoring it, and make thoughtful decisions about why they want to incorporate or reject the feedback. Conferencing emphasizes that feedback is a communicative and reflective process: “It’s not a gift from the teacher, it’s a conversation” (Jennifer Breezee). “I never give grades on student writing. Never.” Jen Doucette emphatically made this statement during her Conferencing Workshop. I immediately sat up straight. Terror! Exhilaration! Her words reverberated through my core. In regards to grades, I constantly tell my students, “You are NOT a number! You’re so much more than that.“ And then I’ll promptly go and put a number on their compositions. The irony does not escape me. How can I expect students to take risks in their writing and grow if they are constantly being tied to numbers and rubrics which have nothing to do with good writing. I’ve known for a long time that I need to sync my assessment practices with my values about teaching and writing, but how can I do it? How will my administration react? What will the grade-crazed parents…and students say? I will be taking a risk by devaluing grades. Yet all worthwhile tasks require a degree of risk. Andy Schoenborn crystallized this concept when he said, “We have to be vulnerable to write.” I would add: we have to be vulnerable to teach, as well. We have to take off our master-teacher suits and reveal our humanity. We are not the holders of all knowledge or all grades, but rather learners and collaborators with our students. Teacher/Author/Writing Coach Penny Kittle describes the importance of writing beside her students and showing her own vulnerability as a writer and a human to empower students to take risks themselves. So, I’m still not sure how I’ll present my “no grade” philosophy to the administration, but I know that I need to open myself up to the risk if I want to encourage my students to experiment and engage as writers. 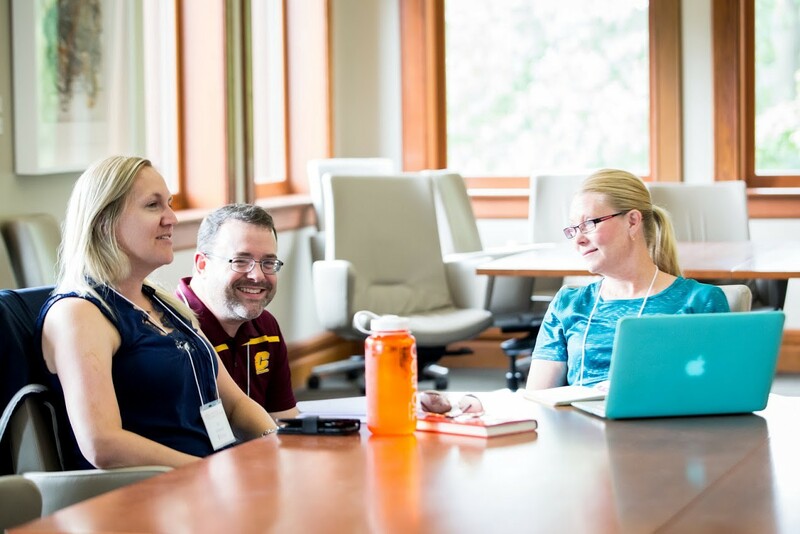 Perhaps above all else, the Conference provided an opportunity to connect, share ideas, and learn from fellow teachers (from all over the Midwest!) who are having the same wonderings about teaching and conferencing and evaluating as me. Equally as important as the workshops and roundtables were the unscheduled moments when we could chat with each other about teaching and learning. I met so many new colleagues who shared books and resources with me and gave me insight on what they learned from workshops I did not attend. They remind me of this professional home I’ve found in GMWP…and now the Midwest Writing Project. We teachers are such a hopeful and inspiring bunch! With their support and encouragement, I’m ready to take the risks I need in order to grow as a teacher and writer. I’m happy to say that the knots in my stomach are loosening; the butterflies are still there, but now I’m excited to take flight with them. September, here we come!